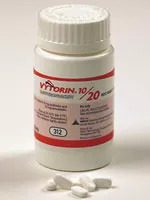 THURSDAY, Jan. 8, 2009 (Health.com) — The U.S. Food and Drug Administration (FDA) said Thursday that it’s OK for patients to continue taking the cholesterol-lowering drug Vytorin. The federal agency made the announcement after completing a review of the results of a controversial study, known as the ENHANCE trial. The trial found that the drug—a combination of a relatively new medication, ezetimibe, and an older statin drug, simvastatin (Zocor)—was no more effective than simvastatin alone for treating patients with high cholesterol. Patients treated with the pricier Vytorin had slightly more narrowing of the arteries—a sign of cardiovascular disease—than the group treated with Zocor, although the difference was not statistically significant. The FDA said that the study may not have been long enough to demonstrate a benefit, and noted that patients taking Vytorin in the study had a 56% drop in LDL, or bad cholesterol, compared to 39% in those taking simvastatin. Elevated LDL levels are associated with a risk of heart attack, stroke, and sudden death. Vytorin is a relatively new way of lowering cholesterol that was first approved by the FDA in 2004. (Ezetimibe on its own is sold under the name Zetia, which was first approved in 2002.) Vytorin lowers LDL cholesterol by blocking its absorption in the intestines, while other drugs work in different ways. Results of a second trial, known as SEAS, were also released in 2008. It looked at whether Vytorin could reduce heart attack, strokes, and heart-valve surgery in 1,873 people with a condition known as aortic stenosis. It didn’t. However, researchers also found that Vytorin-treated patients seemed to have a greater risk of getting certain cancers—such as prostate, gastrointestinal, and skin—than those treated with a placebo. In response, the FDA announced that it was taking a closer look at the drug. And a group of researchers at Oxford University analyzed early data from a couple of other big studies (20,000 patients, combined), called SHARP and IMPROVE-IT, which are ongoing. While there were slightly more cancer deaths in the Vytorin-treated patients in these two trials, it was not statistically significant and most likely due to chance, according to their analysis, which was published in the New England Journal of Medicine.